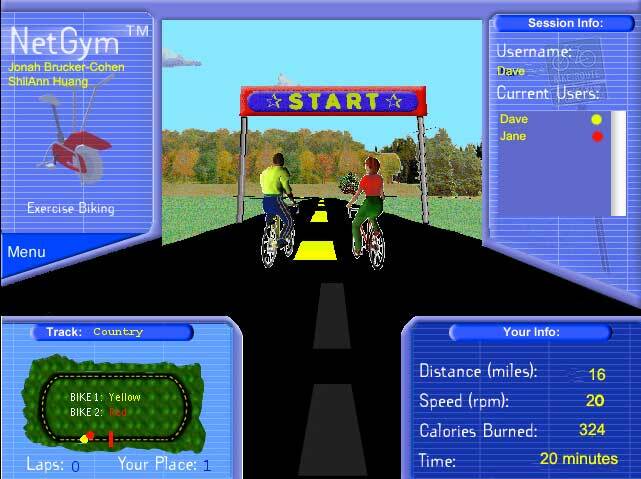 Net Gym – 1999 | JONAH BRUCKER-COHEN, PH.D. Net Gym – 1999 – JONAH BRUCKER-COHEN, PH.D.
NetGym was a prototype for a networked excersize bikes developed in 1999. The project networked two bicycles by placing sensors on their wheels and measuring the distance traveled by each rider and then transmitting this information over the internet to other riders. The idea was that multiple people distributed around the world could go on “virtual” bike rides with each other over the Internet. Jonah Brucker-Cohen and Survivor All-Star, ShiiAnn Huang. NetGym in the New York Times, Circuits, May 20, 1999. How can we make working out more social and networked? NetGym was a prototype for a networked excersize gym that allowed people from around the world to exercise with each other by sending information about each other’s workouts over the Internet. The prototype connected sensors on the bikes to a Basic Stamp microcontroller which relayed distance amounts over serial to the computer. 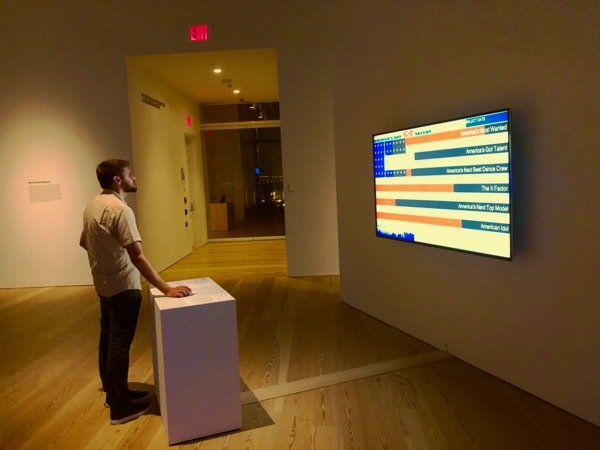 This data was collected by the client software and relayed over the Internet to the other connected computer / bicycle. The results were displayed on the screen so that each rider could see how they were doing in relation to each other. Also on the screen, each rider was represented by an avatar that showed exactly how far away they were from each other on the track. Also sound / voice chat was implemented but it only worked when the riders were in vicinity of each other around the track (similar to the way a real-world conversation would only be possible if the riders were physically close to each other). This was an attempt to add more realism to the virtual bike ride by forcing the riders to stay within pace of each other in order to have a voice-based conversation.